Fenpropathrin ((RS)-α-cyano-3-phenoxybenzyl-2,2,3,3-tetramethylcyclopropane-1-carboxylate; Fig. 1) is a racemic mixture, broad-spectrum pyrethroid insecticide, and acaricide. Discovered by Sumitomo Chemical Company Ltd., then developed by Valent USA, fenpropathrin was the first of the light-stable pyrethroids to be produced. First synthesized in 1971 and commercialized in 1980 (Davies 1985), the technical product (90 % purity) is formulated as an emulsifiable concentrate (30.9 % active ingredient) and is registered in California as Danitol 2.4 EC Spray and Tame 2.4 EC Spray (CDPR 2012b). It is classified as a type II pyrethroid, characterized by the addition of a cyano group at the benzylic carbon. Such α-cyano pyrethroids have enhanced insecticidal activity because of their affinity for voltage-gated membrane channels (Bailey 2009). Synonymous chemical and common names include: α-cyano-3-phenoxybenzyl 2,2,3,3-tetramethyl-1-cyclopropanecarboxylate; Danitol; Danitrol; Fenpropanate; Herald; Meothrin; Rody; S 3206; SD 41706; WL 41706; XE-938; Fenpropathrine; Kilumal; and Ortho Danitol (Kegley et al. 2012). 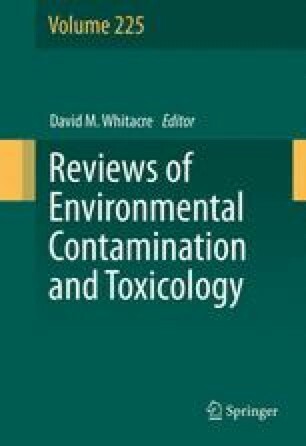 In this chapter, we will discuss fenpropathrin’s uses, its mechanism of toxic action, physical and chemical properties, environmental fate, and ecotoxicology. Support was provided by the Environmental Monitoring Branch of the California Department of Pesticide Regulation (CDPR), California Environmental Protection Agency. The statements and conclusions are those of the authors and not necessarily those of CDPR. The mention of commercial products, their source, or their use in connection with materials reported herein is not to be construed as actual or implied endorsement of such products.